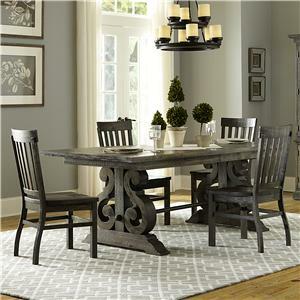 Give your dining space a casual and classic look with this 6 Piece Table and Chair Set. The round pedestal table acts as the centerpiece of this ensemble, with it's black finished base and parquet patterned top. A set of five upholstered chairs surround the table, adding a clean look and ensuring you dine in comfort and style. The The Art of Dining 6-Piece Round Table and Upholstered Chair Set by Pulaski Furniture at Reeds Furniture in the Los Angeles, Thousand Oaks, Simi Valley, Agoura Hills, Woodland Hills, California area. Product availability may vary. Contact us for the most current availability on this product. Browse other items in the The Art of Dining collection from Reeds Furniture in the Los Angeles, Thousand Oaks, Simi Valley, Agoura Hills, Woodland Hills, California area.